Grief counsellors are expected to be on hand this morning at a Cape Breton high school after an 18-year-old woman from a small community on the island died while running Sunday's Toronto marathon. Cape Breton woman identified as Grade 12 student from Coxheath, N.S. Grief counsellors were expected to be on hand this morning at a Cape Breton high school after an 18-year-old woman from a small community on the island died while running Sunday’s marathon in Toronto. Police said the Nova Scotia woman collapsed just a few kilometres from the finish line. Emergency medical personnel told CBC they responded to a call at about 11:08 a.m. near Lakeshore Boulevard and Dowling Avenue, where they found an 18-year-old woman without any vital signs. Andrew McKay, a spectator, saw the girl collapse just three kilometres from the finish line and tried to help her. "I was the first one there with a phone, so I called 911 and told them where we were and to get emergency help over here," he said. "Whoever was around her stopped when she went down, and stopped to help her out. At first, there were two people trying to find a pulse. So, one was trying on the neck, one was trying on I think it was the left wrist from the way she was laying. And they both couldn't find anything, and that's when he said, 'OK, I'm going to start CPR.'" Police in Toronto would only say the girl died from a medical condition and that she wasn't from Ontario. 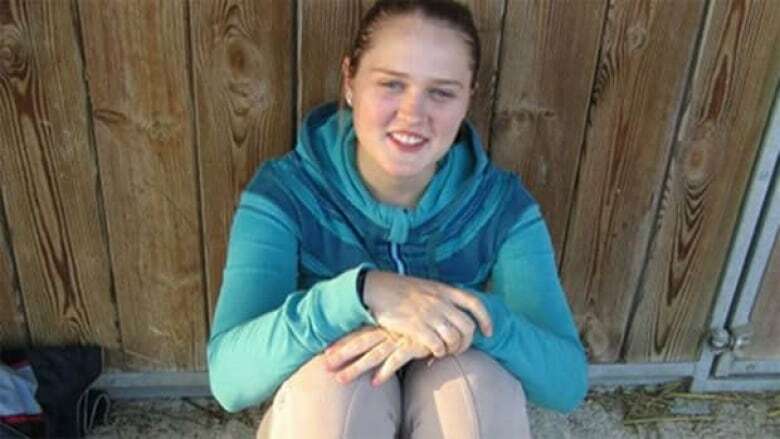 The Cape Breton Post newspaper in Sydney identified the woman as Emma van Nostrand, 18, of Coxheath, a small community just outside of Sydney. She was a Grade 12 student at Riverview Rural High School in Coxheath. She was scheduled to graduate from high school next month. Dr. Chris Millburn, president of the Cape Breton Roadrunners club, knew van Nostrand and her family. He confirmed that this was her first attempt at running a full marathon. "It’s absolutely tragic," he said. "I've been an emergency room doctor for 14, 15 years, and I see tragedy as part of my job all the time. This ranks among the worst few things I’ve ever had to see or deal with. "She’s incredibly nice, humble, [a] successful young lady. She was great in school, she was good at her sports — I know she played soccer and she ran — and she was focused and good at whatever she took on. She’s a real loss for Cape Breton. She was a young person who was definitely going places." Millburn stressed that sudden deaths such as these are unusual. "These type of events are incredibly, incredibly rare," he said. "What people have to remember is that it’s not particularly to do with the marathon, it’s not that she picked something that was unreasonable, or that this wouldn't have happened to her otherwise. It’s just a very idiosyncratic, rare thing. "Some people are born with certain types of electrical abnormalities in their heart which are basically impossible to find, they don't have any symptoms, and sometimes the first appearance of them is when they suddenly collapse. And unfortunately, a lot of people don't get a second chance with it." It is believed that both her parents, identified by the Cape Breton Post as Steven and Katherine van Nostrand, were at the race. A Katherine van Nostrand from Sydney was registered and completed the full marathon with a time of 4 hours, 14 minutes, 26.5 seconds, according to the race-timing company sportstats.ca. Emma van Nostrand ran last year’s Scotiabank Blue Nose half marathon in 1 hour, 55 minutes, 40.1 seconds, according to sportstats.ca. Steven van Nostrand had recently returned from the Boston Marathon, where he had completed the race for the seventh time in a row. McKay said he wants parents and friends to know that she wasn't alone when she collapsed. "She may have gone away for the weekend to go run in a race and didn't come back," he said. "But it wasn't like she was alone when she was out there. She had people with her the whole way, and people who really cared about her who had never met her until she needed them the most." A 27-year-old man who is a police officer also collapsed during the race but was saved by a colleague. Several rushed to the man's side when his heart stopped, just a half a kilometre from the finish line. Toronto police Const. Laurie McCann and two others are being credited with saving the 54 Division officer's life. "And it wasn't typical, like somebody has fallen and hurt their knee, you could tell by [the] scream that it was serious," said McCann. "So I went running over there and within seconds of me getting there, that doctor showed up. I don't know where he came from because I was down on the ground with [the man who collapsed]. You know, I've been on the job 15 years, he wasn't breathing, and he didn't have a pulse." The 27-year-old officer was identified only as Andrew. Following the quick action from McCann and two others, dozens of people took to Twitter calling her a hero. "I don’t think I’m a hero, not at all, no, because it’s not just me, right? There’s two other people in this scenario and I think I saved a life, I did a good thing, and I would do it again in a heartbeat. But hero? No, that’s kind of hard to digest," she said. McCann said she wants to meet the officer she saved and is hoping he's up for a visit today.